See also Dueling Oaks . Pepe owned St. Vincent de Paul cemetery where it is rumored he buried his victims. Photos of Lulla and his tomb are here along with a local obituary notice. It is odd to note the various spelling of his name from both Llulla and Lluta. The NY Times offers this story of a duel / assassination attempt upon Llulla. 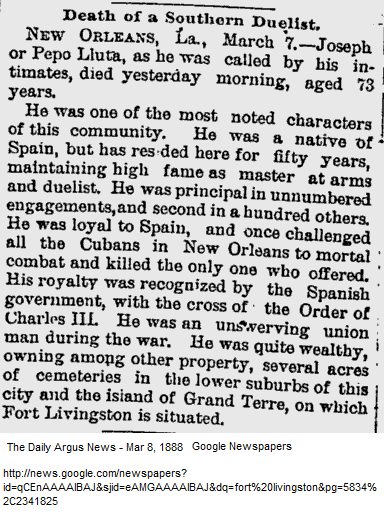 It is reported that Llulla was the lone resident of Grand Terre after retiring there after 1878, however, NYT newspaper archive reports that Sgt Hooten and Sgt Walsh (Ordinance Sgts ) transferred in and out of Fort Livingston in 1881. Still other reports from 1974 declare that all guns were dismounted in April 1872. This NYT article reveals that all big guns and other heavy armament were left at Fort Livingston “owing to the lack transportation“. NYT Feb. 17, 1889. 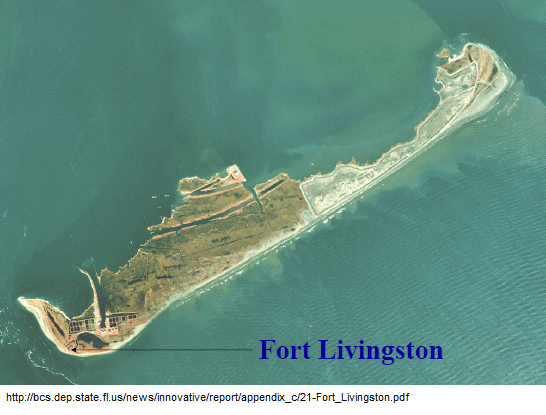 Read NCPTT’s clean up effort at Fort Livingston. You can see why anyone would have a problem with transportation with this photo from this pdf file pertaining to the erosion on the island and hurricanes. This entry was posted in Fort Livingston, Jefferson Parish. Bookmark the permalink.